Majority hotels use simultaneous, multiple electronic channels of distribution, making their rooms available to a relatively wide audience. Making the smartest pricing and distribution decisions for your hotel are the keys that ensure your presence globally. ResAvenue connects your property to all major third party online distribution channels and ensures that your hotel inventory is everywhere it needs to be. 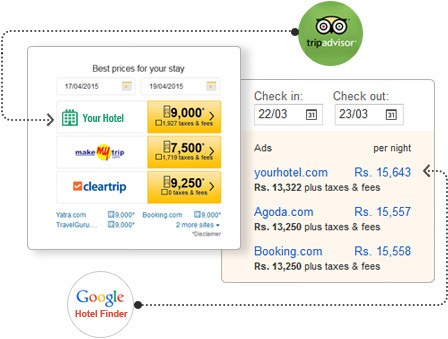 Hoteliers are constantly seeking ways to increase their revenue and online market exposure. 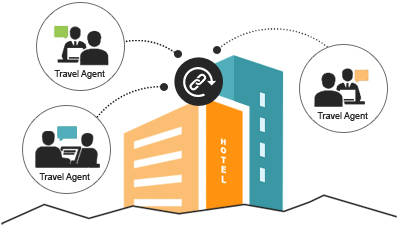 GDS/IDS distribution platforms can open up your hotel to a wide range of potential new bookers who otherwise would not have access to your hotel's rates, room availability and reservations. ResAvenue provides the next generation seamless connectivity through Global Distribution Systems (GDS) such as Amadeus, Sabre, Galileo & Worldspan giving more than half a million travel agents worldwide instant access to your hotel inventory. Additionally, ResAvenue distributes your hotel rates and inventory to millions of bookers through international travel websites such as Expedia, Travelocity, Orbitz, Priceline, Hotwire, Bookings.com, via the Internet Distribution System (IDS). ResAvenue offers connectivity to metasearch sites such as Google Hotel Finder and TripAdvisor where your hotel website and available rates are advertised. This is an efficient way to improve visibility of your property, increase traffic to your website and generate direct business via your ResAvenue booking engine. Don't lose potential guests to OTAs and save revenue on OTA commissions. Expand your geographic reach exponentially not just online but also offline by providing access to your inventory to over 1,00,000 brick-n-mortar travel agents without signing individual agreements. ResAvenue Hotel Connect expands your opportunities to travel agents located both in metros and small towns globally. The perfect distribution partner you have been looking for!